So the other week I had 2 new things happen: one really awesome, the other – I hope it never happens again! Lets just say it involved a 5th grader and his lunch and ended with a trip to the nurse and LOTS of sanitizer! Since my husband has rejoined the gym I attend, I have switched days which I go and attend classes which means no more Tuesday & Thursday RPM class for me. At first I was bummed because I do love RPM but my main man really wanted to get his sweat on at RPM so I figured giving him my favorite class is the least I can do considering he supports me in doing any fitness adventure I throw his way. As I was scouring the schedule to see what was offered on “my” gym day I noticed tabata on the schedule. 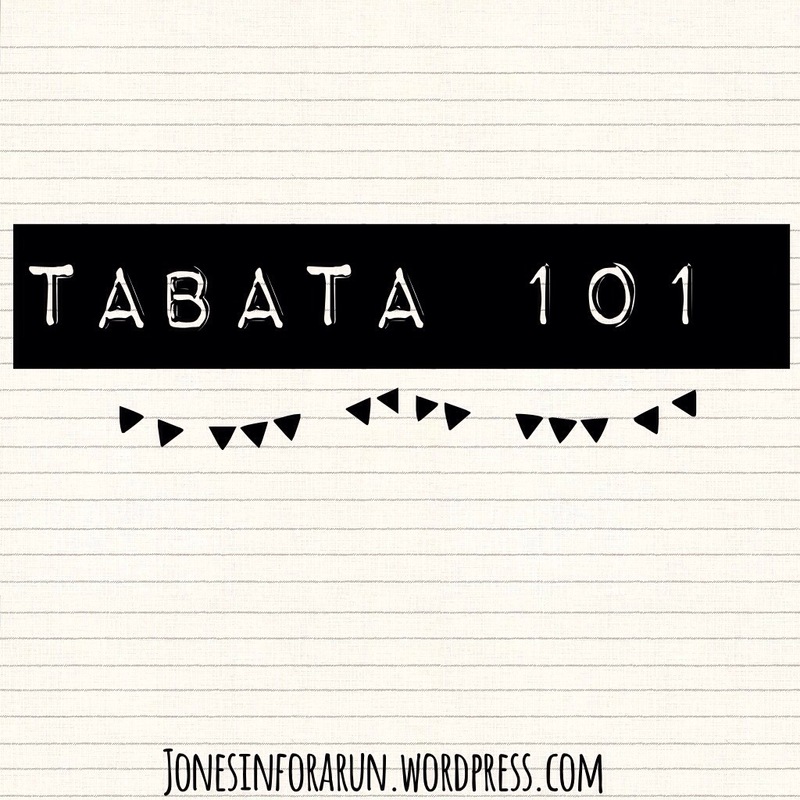 If you are anything like me you have heard of tabata, but the name is enough to scare me away. I do not know what it is about it but the name just seems so intimidating to me! Despite my fearfulness I decided to give it a try- and boy I am glad that I did because it was an awesome experience! So what is tabata anyway? Well http://tabatatraining.org/ has a TON of great information and I highly recommend checking this website out but if you do not feel like clicking that little link here a brief overview: tabata is a form of high intensity interval training and it is awesome. It is set up so you complete 20 seconds of “hard work” and 10 seconds of “rest” for 8 sets and then you have a 1 minute break. It is really great if you are in a time crunch and have no equipment. http://www.fitsugar.com/Printable-Tabata-Workout-23498981 also offers more of an overview and even a sample workout! Download some kind of tabata timer on your phone or ipad– You can check out a few free apps that I downloaded. My favorite of these is the “tabata free” app. You can customize your warm up, intervals, rest and how many cycles. Make an awesome play list! You can set your ipod to have music playing in the back ground to accompany your tabata timer. You will still hear the beeps as your music is playing so pick some up beat, powerful songs and get moving! 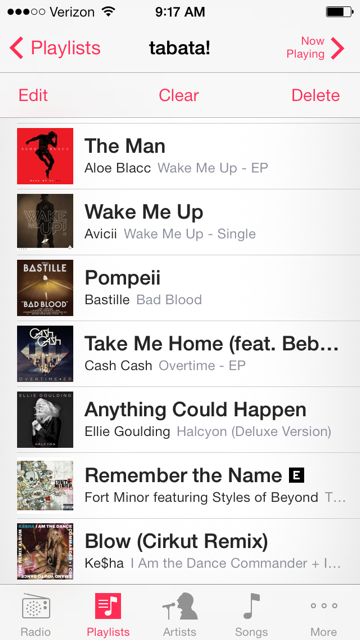 Here is a short & sweet little playlist to get you going! The only thing left for you to do is get some water and get going! I hope that you challenge yourself and try to do a tabata workout at least once! If you are like me you will soon become addicted. I love that you can make these workouts as short or long as you want. The other really great thing is that they go by quick because of the different exercises that you do. Below is a Tabata Workout that I designed! Give it a try and let me know what you think. Feel free to change as needed! Set 1: 20 seconds of push-ups, 10 second rest, 20 seconds squat jumps, 10 seconds rest, 20 seconds push ups, 10 seconds rest, 20 seconds squat jumps, 10 seconds rest, 20 seconds push ups, 10 seconds rest, 20 seconds squat jumps, 10 seconds rest, 20 seconds push ups, 10 seconds rest, 20 seconds squat jumps –and DONE. Continue on with the remaining sets with a minute break between each set. The exercises I have above are very basic and you have probably done in the past but a few that you may not be sure about are probably a lunge jump and cross arm push up. This is a picture from Women’s Health Magazine that demonstrates a Lunge Jump. If you think this would be to hard on your knees you could always do alternating lunges because let’s get real– a regular lunge is hard enough but through in a jump and things just got real! At least give this a try and see how you feel. The cross arm push up is simply a push up and then at the top take your right hand and reach over and touch your left shoulder. Go down and do another push up and this time take your left hand and reach for your right shoulder. It really steps your push up to the next level and makes your engage your core even more! Even if you do your push ups on your knees like me it is still a challenge!! 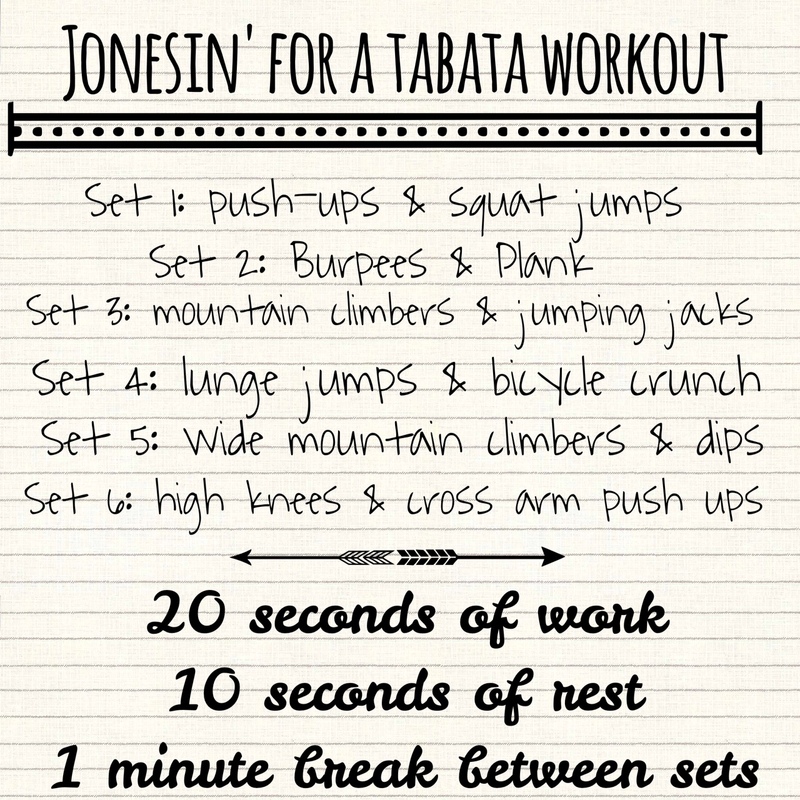 Have you ever tried Tabata before? What are your favorite body-weight exercises? Are you going to try my tabata workout? If so please let me know how it goes!